Netflix presents the first Look at the highly-anticipated futuristic thriller Mute. Enter the captivating world of visionary filmmaker Duncan Jones, featuring Alexander Skarsgard, Paul Rudd, Justin Theroux and newcomer Seyneb Saleh. Duncan Jones, the creative mind behind the cult-hit Moon and Source Code, returns to his creative roots with this original and gripping story set in an immersive universe. Taking place in the near-future, Leo (Alexander Skarsgard) is a bartender living in the pulsing city of Berlin. Because of a childhood accident, Leo lost the ability to speak and the only good thing in his life is his beautiful girlfriend Naadirah (Seyneb Saleh). When she vanishes without a trace, Leo's search for her takes him deep into the city's seedy underbelly. A pair of wise-cracking American surgeons (Paul Rudd and Justin Theroux) are the only recurring clue and Leo is forced to take on this teeming underworld in order to find his love. Today, we have the very first images from Mute. 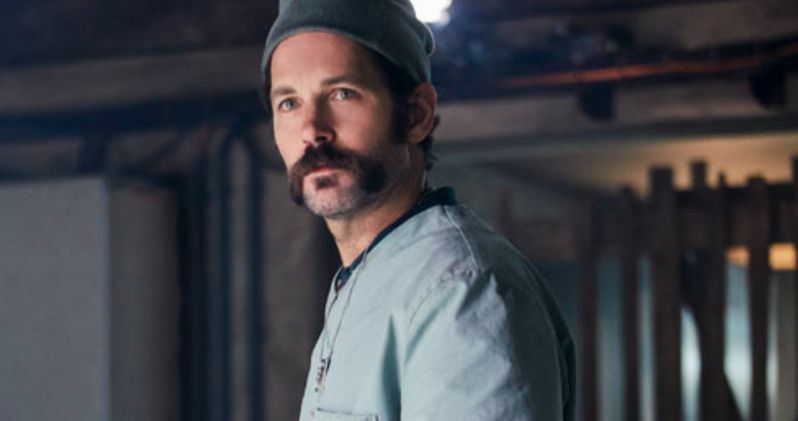 The first features a martini sipping doctor played by Paul Rudd who looks too be doing his best M*A*S*H* cosplay. The second image shows off some of the futuristic backdrop of Mute, which is obviously paying homage to the neon painted backdrops of Ridley Scott's Blade Runner, which is getting a sequel this year after thirty some years. The final image has Alexander Skarsgard, who mixes a 70s sensibility with the look of a future world influenced by Asian culture. Before taking on big-budget video game adaptation Warcraft, which proved to be a smash at the international box office, Duncan Jones created a unique world of low budget sci-fi movies with Moon and Source Code. Mute has been in the planning stages for quite some, and serves as part of a trilogy that also includes Moon. It isn't clear how these movies connect. Though, Sam Rockwell, who played the lead in Moon, is rumored to cameo in Mute. When prompted in an earlier interview about Rockwell's supposed appearance, star Alexander Skarsgard said "maybe". Mute takes place 30 years from now in a dystopian future. The movie takes place in Berlin and is firmly centered on Leo Beiler's mute bartender who is looking for his missing girlfriend. In order to track her down, he will have to go head-to-head with the city's gangsters. Here is how Skarsgard describes his character in the movie. "It's about a guy who was in an accident as a kid. He's ex-Amish, so he lives a very monastic life: he doesn't have a cell phone or anything like that. He's left the [Amish] community but he still kinda follows the rules." Mute wrapped production in Berlin last year, and is the fourth feature-length movie from Duncan Jones. His most recent movie Warcraft didn't fare well on the domestic market, but it did score an impressive $433 million worldwide, making it the highest grossing video game movie of all-time. Before that, he won critical acclaim for Moon and his 2011 movie Source Code was a success, grossing $147 million worldwide from a $32 million budget. Mute doesn't have a firm release date at this time. And a trailer is rumored to be just around the corner. While we wait, here is our first look courtesy of Netflix.